The Cohen testimony, a new Breaking News Consumer's Handbook, the risks of laundering our hot takes through history, and the story of an infamous Nazi rally. When President Trump’s former personal lawyer testified in front of Congress this week, it was both captivating and oddly familiar. This week, On the Media looks at the tropes that ran through the hearings, and offers a guide to news consumers trying to understand the tangled threads of the Mueller investigation. Plus, a sideways glance at historical hot takes and a second look at an infamous Nazi rally in the heart of New York City. 1. Bob and Brooke on Michael Cohen's enthralling testimony this week. Listen. 2. Eric Umansky [@ericuman], co-host of Trump, Inc. from WNYC Studios and ProPublica, on how news consumers can best understand Mueller-related news. Listen. 3. Corey Robin [@CoreyRobin], political theorist, on the tendency for journalists to launder their hot takes through history. Listen. 4. Marshall Curry [@marshallcurry], documentary filmmaker, on his Oscar-nominated short, A Night At The Garden. Listen. CORRECTION: In the opening segment, we describe U.S. Representative Jim Cooper, of Tennessee, as belonging to the wrong political party. Rep. Cooper is a Democrat. Judge Amy Berman Jackson will rule whether he has violated the conditions of release after a hearing Thursday. I’m curious if there are charges the special prosecutor is holding back on to get people to flip for one final round that will come back and knock down the entire house of cards? 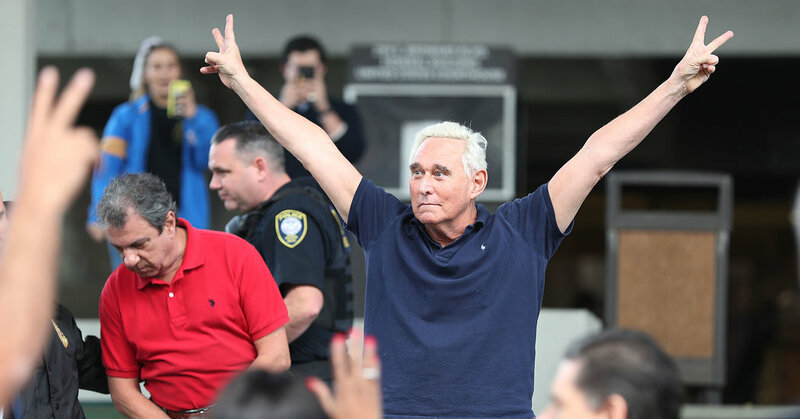 The radio host who claims Stone used him as a false alibi says Stone threatened him.